Brasserie Zédel was initially very much a word of mouth destination on the edge of Soho and Piccadilly. Hidden from the world by virtue of being underground and entered via a staircase at the back of a small café, ZL Café, at street level, it wasn’t really a place you were likely to stumble across. Unsurprisingly, as with any great place, word of mouth quickly spread and it’s now a staple of the London dining scene, serving up classic French dishes. What first strikes you about Zédel is the scale of the place. Entering through the small street level café, you head to the back and down a large marble clad staircase. Opening up in front of you is a marble clad art deco double height vestibule with coat check, American Bar, live performance room and Brasserie Zédel all leading off it. 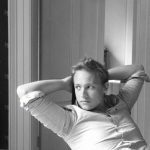 You’ll instantly know the Brasserie thanks to the queue; booking a table is key these days, but they always keep back some for walk ins – though these days if you can get a walk in table with less than a three hour wait, you’re a better person than I. The Brasserie is a large open art deco dining room with columns, music stage, bar, plush red banquettes and waiters in traditional black waistcoat and apron tied round their waist. The food on offer doesn’t miss a beat, it’s got everything you’d expect to find on a menu of a Parisian brasserie: Steak Haché, Escargot, Bouillabaisse, Boeuf Bourguignon, and Entrecôte. The Plat de Jour is always worth a look – on Saturday it’s that French countryside classic of Lapin à la Moutarde (rabbit in a mustard sauce). Also in line with a French brasserie are the incredibly low prices, made all the more incredible by the quantity and location. But at £9.95 for two courses or £13.25 for three, the best value is the set menu. It’s not changed in the years I’ve been going but diners keep going back and you will see plate after plate of it making its way to diners. I know of top food critics and people in the restaurant world who go back time and again for it, even listing it as one of their favourite meals in London. The offered starter is classic Carottes Rapées, or as we’d call it, grated raw carrot with vinaigrette. Sounds dull, and personally I hate raw carrot, but my god does it pack a punch on the flavour scale and oh how I enjoy it. 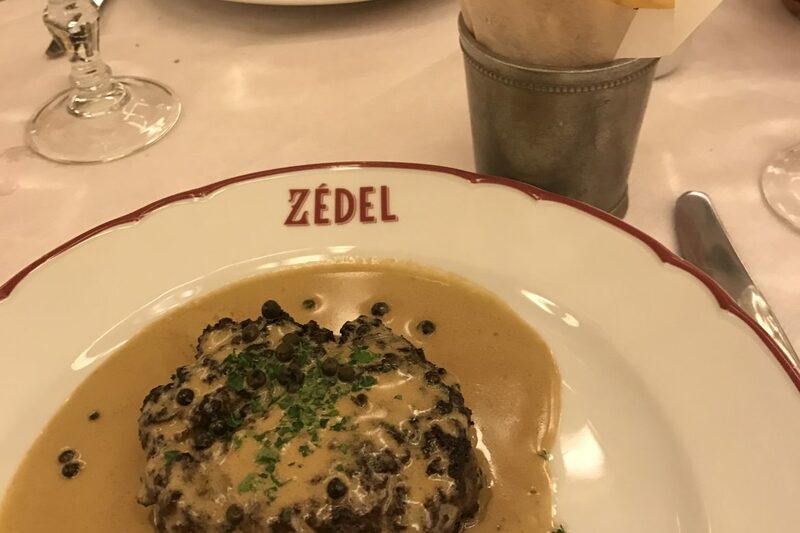 The main, and the star of Zédel, is the Steak Haché with pepper sauce and fries. Normally £9.75 on the a la carte, you can see why the two course set menu is such good value – your second plate only costs 20p!!!! The haché, made of beef not the horse you’d find in some establishments in France, is cooked to request and always perfectly so. The sauce is just so unctuous and creamy with that heat of pepper that makes you want to dip the light, short and crisp French fries in. It is a dish that will give you withdrawal systems.